Here the littoral landscape is practically in the immediate vicinity of the mountainous and forested region of Gorski kotar, the Mediterranean clime and way of life are first neighbours with the harsh mountain climate, while the world of a fashionable tourist resort boasting a150 year long tradition is so vastly different from the simple rhythm of the island life. 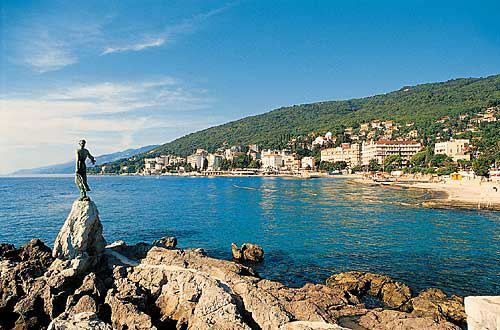 Kvarner is a place where those seeking the glitter of trendy summer resort - like the lovely Opatija whose tourist tradition, parks replete with lush greenery and elegant villas, combined with the 12 km long promenade by the sea, attract guests throughout the year. Perhaps you imagine an ideal holiday, one where you can set off from the shore towards sunny islands, and then sail back to seek the peace and quiet of a mountain peak. In the process you dream of a sun-bathed Riviera that can, should you so wish, be replaced within a span of 10 km by ascetic peace and fresh mountain air where you are in the company of eagles, wolves and bears, and where your lungs are filled with forest scented air. If that is indeed the case, then you are looking for Kvarner and Gorski kotar - separate parts of this small country that differ significantly one from the other. The key eno/gastro words of Kvarner are Vrbnička Žlahtina, Trojšćina, Kvarner scampi, lamb, "šurlice”, chestnuts and Rab cake. Vrbnička Žlahtina is a famous autochthonous white wine from Vrbnik, as is Trojšćina from the island of Susak. The scampi from Kvarner are the largest and the best in the Adriatic, whilst lamb with sheep cheese is the most famous gastro product in Kvarner. 'Surlice' from the island of Krk is pasta and is eaten with all types of goulash or seafood. There are also the Lovran chestnuts and filigree Rab cake.